Frank Warren is a savant when it comes to secrets—recalling, when prompted, many of the anonymous ones he’s published online (PostSecret.blogspot.com) and in his books. 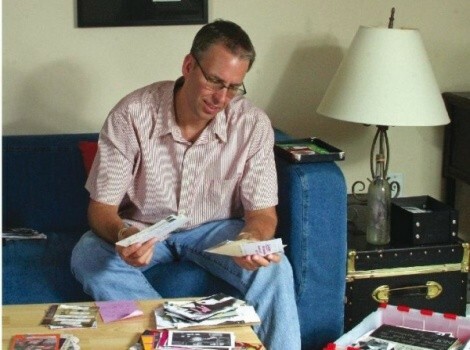 He’ll share the strange, the funny and the banned while offering audience members an opportunity to share their own secrets at this week’s PostSecret event at the University of Utah (Olpin Union Ballroom, 200 S. Central Campus Drive, 801-581-5888, Wednesday, April 14, 7-9 p.m.). Have any secrets moved you personally? “Sometimes I wonder if God is real, and if he is, then why did he let my dad die? And why does he talk to some people but he never talks to me, even when I talk first?” I’m especially touched by young people’s secrets that describe some of the difficult times I went through when I was young. Through this project, I’ve realized there are two types of secrets: the ones we keep from others and the ones we hide from ourselves. Because of this project, I’ve been able to face those secrets that were haunting me. Are there similar responses to reading a secret and a poem? Actually, I often compare secrets to poems. Secrets are inexhaustible; I’ve received over a half million, and they’ll never run out, which is the same with poems. Sometimes the words are chosen so carefully the secret reads like poetry. It can really be a strong work of art. Also, one of the most powerful moments a person can have is when they hear or read a secret that they are struggling with articulated by a stranger better than they can say themselves. You can get quite an epiphany. Why post secrets? Why not just tell another person? The barrier can be many things. Maybe they are struggling with facing that secret themselves. Maybe there is a trust issue that’s making it difficult. Maybe by sharing that secret, it will change things. Sharing a secret can be transformative; they have great power. They can be delicate, but they can be devastating. Do you get many from Utah? Actually, Salt Lake City is one of the most common places we receive [secrets] from. My wife’s family is all LDS, so I’ve gone to the Mormon church. Maybe, in a tightly religious environment, there is the possibility of more secrets. That’s just a guess, probably a bad one. Will you share a particularly funny secret? Do you think any of them are fictitious? I think some of the secrets can be both true and false at the same time. Maybe false when you write it but true on the Website—a different way of coming out to yourself. Does the online success of PostSecret indicate that people are become more lonely? Any differences in your latest book Confessions on Life, Death and God? There are five books all together,and each one tries to tell a different story. Like the other books there are secrets that are funny, hopeful, shocking, but this one has more soulful or spiritual secrets. For example: "I'm a Christian who is falling in love with someone that doesn't believe in God. I think it's a beautiful love story." Also, I have one secret in every book; in this book, I have two on page 103. What's a PostSecret event like? Every event is different, I try to share some of the funny and inspiring images and show some that are banned by the publisher. There's also a multimedia presentation. My favorite part is to invite audience members up on stage to reveal their own secrets. They range from funny to sexual to spiritual to eating disorders. There's a lot of electricity in the room, it can be emotional.